I’m surprised. Not that last week’s blog turned out to be controversial and generated quite a few comments on this website and even more emails, but that that traffic was so danged nice. Almost all of it was supportive and thoughtful. In fact, a grand total of two comments (posted on the blog) were anything less than, uh, “complementary.” Not that everybody else agreed with me, you understand; that’s something I wouldn’t want, anyhow. What’s the fun in that? If nothing else, your interest shows y’all don’t want me to steer clear of controversy. So, when the occasion arises, I just might pull out that ol’ soapbox again. This week, though, back to amateur astronomy, and that part of amateur astronomy so many of us follow with such fervor: gear. New gear. Given the title, I reckon that unless you’ve been snoozing under a rock for the last year you know what I am talking about, the ETX LS. Before I express my preliminary thoughts on this new SCT (yes), though, let’s quickly review where the ETX has been. Where it’s been in the thirteen years since Meade gave birth to the small wonder is in a lot of amateur astronomers’ backyards. Particularly beginning amateur astronomers’ backyards. I’m stating the obvious when I say many of y’all got your start on the road to Obsession 20s and C14s when a little ETX 90 on the shelf of the (late, lamented) Discovery Channel Store caught your eye and your heart. It’s hard to believe, but the youngest amateurs among us can’t remember a time when there wasn’t an ETX. Not that the ETX is respected and admired by everybody. Hardly. The ETX 90 and her follow-on sisters, the 125 and the (now discontinued) 105, have never been perfect telescopes for beginners. The 90, especially, is limited by a small aperture that makes it ill-suited for anything much beyond casual looks at the Moon and planets and brighter deep sky objects. That is enough to open up a whole world of wonder, though. And that deficiency is also shared by the Questar 3.5, which is respected and admired by just about everybody. Otherwise, though, there’s little comparison between the two scopes. Well, except maybe for the optics. Like the Q, the ETX has and always has had exquisite optics fully competitive with the Questar’s J.R. Cumberland marvels. The catch is that when you have to keep the price way down (the ETX 90 is currently $599 and the 125 is $899) and the optical quality way up, and throw in a fully functional computer-go-to system, something has to give somewhere. Where it gives with the ETX is almost everywhere beyond the optics. The scopes’ fork mounts, as you would expect, are plastic driven by plastic gears. Backlash? Yeah, a lot. Gears that can strip in gear mounts that can break away with even a minimal amount of abuse? Yes ma’m. That’s never been all, either. Many early 90s were afflicted with the Sliding Baffle Syndrome. The baffle around the secondary mirror on the inside surface of the corrector was originally affixed with glue that tended to let go in warm temperatures. What you’d notice first would be that the baffle was slightly off-center compared to this Gregory Mak’s silvered-spot secondary. Eventually, if you didn’t take steps, the baffle would go ker-plunk on the primary. Tighten down the altitude lock a wee bit too much? You might find it would never work again, leaving the tube drooping sadly in its little fork. Quite a few excited amateurs received pretty new ETX 125s that had dead drives. The problem stemmed from a connector in the scope’s base that inevitably came loose during shipping or soon thereafter. Oh, I could keep going on about the Small Wonder’s many faux pas, but you get the picture. Which doesn't mean Meade ain’t taken steps to improve the scopes over the years. They have, upgrading the mounts and electronics and software continually. For example, the original 125’s fork was a completely plastic affair that was incapable of holding the surprisingly heavy 5-inch MCT steady. Eventually Meade replaced the plastic with metal (though still plastic covered). The Autostar hand controller the ETXes have used since they went go-to not long after their birth has lots of features, but it took years to get the software right. For the longest time, for example, the Autostar was prone to “rubber-banding”—you’d center an object with the hand control, and the Autostar would resolutely reposition it at the edge of the field as soon as you let up on the buttons. Meade exterminated this and many other bugs via software updates (often a couple a year); it just took a long time. Another problem always suffered by the ETX, and in recent times also by Meade’s more expensive telescopes, is poor QA (quality assurance). Far from getting better over the years of the ETX’s run, it seems to have gotten worse in the second half of this decade, perhaps because of the company’s exacerbating financial problems. My own ETX 125 PE, Charity Hope Valentine, is an example. As delivered, she worked pretty well, but it took some work from me to put her exactly right. Two of the three problems she exhibited out of the box were minor. The “Meade” label on the tripod head had been applied upside down. Not a big deal, but it looked bad and made Meade look bad at a time when they needed all the customer goodwill they could garner. Yeah, I understand the Chinese person who assembled the tripod (likely a young woman) probably couldn’t read English and didn’t know if “Meade” was right-side-up or upside-down. A means could have been found to make it easy for a non-English reader to put the nameplate on right-side-up if anybody had cared, however. In addition to the nameplate, I found the RA setting circle (a metallic strip) was mis-applied, its ends being glued solidly to the base, making it impossible to adjust and thus impossible to use. Yeah, I know, who’s gonna use an analog setting circle on a go-to telescope? But, like the nameplate, it looked bad, cheap, and a little pathetic. A close look indoors revealed the eyepiece tube was crooked. It had been screwed into the (plastic) rear cell at an angle. What to do? Given the turnaround times for repair from Meade, I decided to take a chance. I retrieved a small strap wrench from the toolbox, gently but firmly unscrewed the focuser tube a bit, and then reversed directions. It popped right in and was suddenly perfect. Subsequent use showed the weird reflections had been banished. But I don’t mind tearing into any telescope; what about the person who does? A long repair wait or the hassle of an exchange. And the person who didn’t notice the focus tube misalignment (I didn’t at first, remember)? They’d just assume their telescope’s optics were lousy. Moreso than the design missteps and the QA fumbles, one thing has kept the ETX from being the perfect novice scope. It is small and cute, sure, but it can also be fussy and frustrating. Don’t do things the right way, or don’t do them regularly, and you’ll want to stomp the little thing into the dirt of the observing field. That’s well-illustrated by my recent trip to my dark site with my 125. It looked like a perfect ETX night: hazy, occasional clouds. Not the kind of evening that inspired me to drag out a big CAT or even a C8. It was also at the end of a very trying work week. Still, I wanted to hang out with my bubbas and see something, and that, my friends, is the classic ETX Night. I can have Charity setup in ten minutes, and back in the car just as quickly. In fact, setup was so quick and easy on this night that I found myself with time on my hands before sundown: “I ain’t used the scope in months; better power her up to see if that dadgummed battery is still good.” I didn’t mean the battery that powers the 125. I eschew AA cells in the drive base (usually) and hook her to a hefty jumpstart power pack. No, I was worrying about the button battery used to power the LNT. The ETX PE is equipped with Meade’s “Level North Technology” finder, a red dot job that incorporates a real time clock, an electronic compass, and level sensors. It’s like GPS without the GPS. Unless you move to a substantially different geographic location, all you have to do to get the scope aligned is place it in a simple “Home Position” and power up. The PE levels, finds north, and gets date and time from the LNT. Great feature, but it has an Achilles heel. The small CR2032 cell (that Meade misidentifies in its manual as a “2023”) that holds date and time in memory lasts for about six months at most despite Meade’s silly claims that it will last for years. It had easily been six months since I’d been able to use Sweet Charity, and I expected the battery to be dead or nearly so. Which it was. The Autostar’s time and date were way behind. If I’d just said to myself, “Self, we’ll need to change that soon; tonight we’ll enter time and date manually,” all would have been well. Maybe I’d forgot how difficult it is to change this battery on my early-model LNT, or maybe I was just bored, but I foolishly decided to replace the cell while I waited for dark. First problem? I immediately dropped one of the two screws that hold the LNT halves together. Hunting around in the tall grass easily ate up a good ten minutes. Screw located, I managed to change the cell without ripping out the delicate wires that run from the top of the LNT to the bottom and got it back together. In Meade fashion, the act of changing the battery necessitates more work. First, you’ve got to realign the red dot finder, since the screws that hold the LNT together also adjust finder alignment. Second, you have to do something called “Calibrate Sensors” because changing the battery causes the telescope to forget where true north is compared to the magnetic north it gets from its compass. Readjusting the red dot is a pain, but since our dark site is adjacent to a private airfield, I was able to use runway lights to get it dialed-in with just a little cussin’. I then proceeded to Calibrate Sensors, but had to stop halfway through. It wasn’t quite dark enough to see Polaris, which is needed for the calibration, so I had to wait until the sky darkened some more. By the time I finished fumbling with the Autostar following Polaris’ appearance, hordes of stars had appeared, but I was in something of a snit. What good does it do to have a scope that’s quick to set up if you have to waste an hour playing with it? Why couldn’t Meade have made the battery easily accessible? Why couldn’t they have designed a circuit that would keep the LNT memory fresh, if not in CMOS, at least long enough to change a cotton-picking battery? Sheesh! Oh, well, at least I could now do an alignment and get down to observing with my girlfriend. Ha! Charity wasn’t done demanding attention. Alignment went smoothly as it almost always does, Miss Valentine picking two stars and slewing to them and me centering each in the main scope. Being that my girl is a little on the high-maintenance side, howsomeever, I was a mite suspicious when we was done. Trust But Verify. M3 was in a good spot for looking at, so I mashed the Autostar buttons to send Charity there (on my Autostar, due to either defect or because I don’t use it that often, I really have to push them buttons hard). Miss Valentine made her usual coffee grinder noise, beeped, her way of saying, “Unk Rod, we have arrived,” and I jammed my eye to a 20-mm eyepiece. Anonymous starfield. No big star ball of a globular did I see it. Dadgummit! Time to Train Drives. All inexpensive go-to rigs exhibit some backlash—gear “slop”—and if go-tos are to be accurate, that has to be taken into account. Celestron does that by having you do final centering of alignment stars using the up and right keys only. Meade takes a different path with something called “drive training.” It’s pretty simple to do. Center an object, execute the training routine, and the scope slews away from your target. You then use the Autostar buttons to put the object back in the center of the field. Do that with both altitude and azimuth axes, and the scope will know how much backlash is present, and go-tos will be right-on. Trouble is, you have to do this every once in a while. Why, I don’t know, but I have to retrain drives maybe once or twice a year. I’ve sometimes thought the need to re-train coincides with changing the LNT battery, but I’m not sure why that would be. Anyhoo, on this particular evening I couldn’t use a terrestrial target (which for some reason seems to be better for training than a star), since the runway lights were now off, and had to use Polaris instead. Nevertheless, when I sent Charity back to M3, that great glob was now reassuringly centered in the field of the 20 Expanse. Takeaway? If you are an ETX owner, be prepared to continually have the truth of two laws affirmed: Murphy’s Law (“Anything Bad that Can Happen Will”) and Finagle’s corollary to Murphy’s Law (“At the Worst Possible Time”). Despite the occasional irritations, I come here not to bury the ETX, but to praise her. How’s that? Start with the optics. They are dead sharp and also high in contrast despite a sizeable central obstruction brought-on by the secondary’s baffle. Yeah, aperture rules, but under the conditions that comprise an ETX Night, that rule can be bent a bit. My 5-inch ETX doesn’t give up much to a C8. Sometimes I even think planets look better in the ETX than they do in the eight-incher. One thing’s sure; the edge of Charity’s field is sharper than that of an SCT. Yes, the ETX’s f/15 focal ratio means you won’t be taking-in the whole of the Pleiades in one go, but it also means even an humble Orion/Synta Expanse performs more like a TeleVue than the bargain basement eyepiece it is. Go-to? When you’ve got the drive training sussed, it’s fairly impressive. On the night under discussion, I observed about 35 objects before incoming haze and clouds shut us down about midnight. With only an exception or two, all were in the field of the 20-mm Expanse (66 degree AFOV), and often in the field of the 15 or 9-mm Es. All in all, go-to performance was similar to that of the NexStar 8i set up next to me. Yep, despite the occasional headaches, I still think the ETX is a wonderful telescope. I love my Sweet Charity very, very much, and I will never, ever stop using her or sell her. Oh, shortly after Celestron re-released the NexStar 5, I’ll admit I toyed with the idea of turning her in for one of them new Orange Tubes, but a little thought and a couple more times in the field with Charity banished that idea. Her images are at least slightly better than those of a C5 (I’ve done a shootout between the two scopes), and, while very nicely built, the Celestron has its warts, too. Yeah, as I’ve said before, I occasionally fear Charity is gonna collapse on the observin’ field in a self-pitying neurotic heap, but she never has after nearly four years. One thing I will say for sure, the ETX is definitely a scope with personality, even if it’s not always a normal personality. No matter how much I love Charity, though, I’ve sometimes wished for a just slightly better ETX. One with less plastic, especially in the gear train, better QA, and better build-quality. Surprisingly enough, about a year ago Meade, at the time in the throes of daunting financial woes, announced we was to get just that with something called the “ETX LS.” First thing I heard about the LS made me real happy: this was to be a 6-inch instead of a 5-inch. The second thing I heard made me come back down to earth just a little bit. This was to be an SCT, not an MCT. Hell, y’all know how much I like SCTs, but I actually prefer MCT optics in small apertures. The small ones seem real easy to make very well. SCTs? Meade’s record with little ones is not stellar. The old 2045 4-inchers had good build quality, but their optics were nothing to write home about. On the other hand, Celestron is making waves with a 6-inch SCT of outstanding quality, the new C6, so I figgered I’d take a wait-and-see. The third thing I heard just made me sad. Meade would be discontinuing the two remaining MCT ETXes. Further details about the LS in the form of full-color ads were soon being scrutinized by me and my CAT loving brothers and sisters. What was being made the most of in the spreads was the fact that the new ETX would incorporate what Meade called “Light Switch” (LS) technology. The user would set the scope up on its tripod, throw the (nice, big) power switch, and the scope would north and level with the aid of a real GPS. That the ETX had gained a GPS was not the big news. What stopped the presses was that Meade said the LS user would no longer have to center go-to alignment stars. What caught the interest of Astromart and Cloudy Nights cognoscenti at the beginning was the telescope’s built-in camera, which Meade called the “ECLIPS CCD.” At first, quite a few folks figgered this camera would shoot through the main scope. Admittedly, the wording in the ads was vague, but it seemed self-evident to this old boy that the only way to take in a big enough swath of sky to be of help during alignment would be to shoot through a short focal length camera lens, not the main scope. As Meade’s ads and manuals issued shortly before the LS began shipping made clear, that was indeed the case. The CCD could be used for informal short exposure imaging of constellations, but this small-chip uncooled camera, which was slung under the tube, not unlike the Quester 3.5’s built in finder, would never be practical for long exposures of small objects. Hints by Meade that it might be possible to run one its DSI cameras with the LS’s Autostar III without a PC in the loop didn’t do much to mollify those who thought they’d been misled. These people were also P.O.ed (so was I a little bit) that the original quoted price, $1299, it turned out, would not be for the ACF (aplantic SCT) version; instead, it would be for standard SCT optics, with ACF LS being 200 bucks more. The good news for me? Apparently Meade’s new CEO, veteran Steve Murdock, decided the MCT ETXes would live on. What else was evident about the LS? That there’d be plenty of glitz, starting with something Meade called “Astronomer Inside.” What this was, according to the ads, was not just text descriptions of objects ala’ the Autostar and Autostar II, but oodles of multimedia. Audio. Video. Animations. Stills. How would you see this video? What would have been cool would have been for a small color display like that used by the ill-fated MySky to have been incorporated into the Autostar, but that was not to be; instead, the scope would be equipped with audio and video outputs (and a built-in speaker), allowing a user-supplied video display to be attached. This all sounded OK to us old-timers. Most of us, anyhow. The usual crew of curmudgeons were outraged the LS would free novices from having to identify and center alignment stars. All I can say is they must not have helped many newbies work through their go-to problems. When the new scope won’t go-to its go-tos, the most likely culprit, even more common than insufficient power sources, is misidentification of alignment stars. Hell, that’s even stumped me a time or two, since most go-to systems identify stars by proper names rather than Bayer letters. I know dadgummed good and well where Beta Ophiuchi is, but where is “Cebalrai”? In my humble opinion, anything that helps beginners is a Good Thing. A good thing for them and a good thing for us. If we can keep them in our avocation, they may even go on to learn them bright stars and constellations. But they will only do that, most of them, if they have a good initial experience. Sounded to me like this little scope could be just that experience, with decent aperture and the promise of a foolproof alignment system (as if there can ever be such a thing). This system work have to work well and consistently, though. If the LS turned out to be as fussy and QA challenged as the other ETXes, novices would be more hurt and dismayed than helped and elated. If there was one thing that indicated the ETX LS might be a success, it was what I saw at NEAF. No, Unk wasn’t there. Someday I will make the pilgrimage to that astro-gear Valhalla, but I was on the sidelines again this time. I did see videos and stills of the show thanks to the Cloudy Nights crew. One of which was a shot of the LS undressed, with the cover off its (single) fork arm. Not only was it apparent how undersized the OTA is compared to the mount, but also how much better the metal gears inside that fork arm look compared to the plastic, grease-slathered 90 and 125 gear trains. 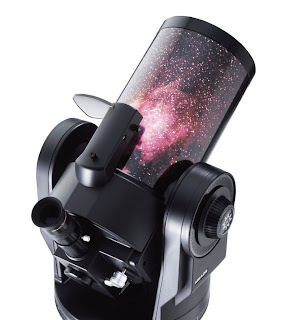 So impressive did this mount appear that I opined Meade might even have an entire LS series in the offing, including maybe even an 8-inch that would nudge-out the LX90. Only time would tell, of course, and we had plenty of that, with winter morphing into spring with still no ETX LSes in the hands of users. I had been hearing rumors that Meade was pushing the Light Switch back again, to fall, when my good buddy Bob Black (of the excellent dealership, Skies Unlimited) told me he had received one. Bob’s experience is only part of the story, of course. What remains to be told? It will be a while before we know whether QA will be good enough to ensure all LSes do as well as the one Bob tested. The initial reports I’ve had from the small number of amateurs who’ve received ‘em thus far are mostly (though not all) encouraging. Me? Would I, based on what I know now, buy one, or replace Charity with one? Like I said, I will never part with my Sweet Charity. Could I see having an LS in addition to Miss Valentine, though? Maybe. It still remains to be revealed just how good Meade’s 6-inch SCT optics are. Much also depends on the things Meade (and third parties) do with the scope in the coming months and years. All the audio and video and processing power the scope possesses and the fact that it is equipped with an SD card slot makes it sound like it ought to be possible to do some amazing and innovative stuff with it. We shall see. In other words, “Naw, I ain’t gonna run out and buy no LS at this time (even if I sorta want to),” but if I get my hands on one otherwise, you-all will be the first to hear about my experiences. I am frankly excited about this telescope, both for what it is now and for what it could be. My ETX-90, long gone now, was the EC version, as in, no Goto. As such I had no problems with it. Just run that one screw out on the backside of the controller, tilt the base over on the tripod, get an as accurate a polar alignment as I could, and just find my own objects and let the ETX track. Worked just fine. It has passed to younger hands now, but at last report it was still running fine, nearly 6 years after I bought it. And I bought it brand new. And as you said, very sharp optics. I almost did buy a 125 as an upgrade, but then Celestron introduced the 6" SCT on the CG-5ASGT mount, and I went that route instead. I still remember the fun I had with the little ETX. It was a winner. Interesting post. Aside from the quality control issues, my concern is that Meade isn't properly managing expectations from beginners in amateur astronomy. The company clearly strives for making it easier for newcomers and that's commendable. 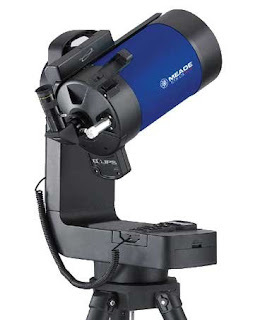 But once they peer through the eyepiece and discover that deep sky objects aren't at all like they appear in photos, will they keep using this equipment or dump it on Craigslist along with the rest of Meade's previous lines? Time will tell. Rod, that looked like an interesting red dot finder on your ETX. What is it? What can I do to improve the dreadful factory supplied finder scope on my ETX 90 RA model? I picked up mine for use as a terrestrial spotter, and would love to use it as a quick look or double star scope, if only for the finder!